The Textbook Issue- “Comfort Women” Description Changed or Eliminated from Junior High School History Textbooks. In 1991 “I was forced to be a ‘Comfort Woman’ for the Japanese Imperial Army”, discloses Ms. Kim Hak-soon (Korea), the first to come out as a former “Comfort Woman”. 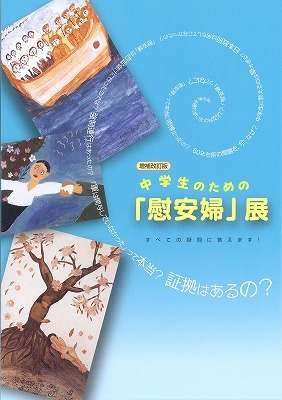 Until1997 middle school students in Japan learned (about the) “comfort women” issue but since that time this information has been removed from most history textbooks. The Japanese government, through the Ministry of Education and Science submits recommended revisions to publishing companies. This demonstrates that the government censors the information being taught in schools in this way the Japanese government is rewriting history in a way which distorts the historical truth about The 15-Years War. There are still many women who were forced to be ‘Comfort Women’ in Asian countries. They are still furious because the Japanese government refuses to admit responsibility and to make an official apology. Not only the Japanese government, but also the media and many citizens refuse to listen to the voices of these women and deny and contradict the truth. This special exhibit was meant for middle school students. It is an exhibit for everyone that wants to know the truth about The 15-Years War, including the generation who personally experienced The War.